SIt’s been 116 years since the birth of modern air conditioning. Ironically, it’s older than Las Vegas itself! The first commercial AC system was unveiled in 1902, where it was introduced to control humidity in a printing plant. Previous attempts date back to Roman times when water was circulated through walls to cool the interiors of only the richest citizens. Other largely inefficient and expensive efforts include transporting massive amounts of snow from nearby mountains — an exercise that holds true today in its “spare no expense” attitude towards cooling our world in the hot summer months. In Las Vegas, our first AC-equipped building was the El Portal Theater on Fremont Street, which surely made it a popular venue for whiling away on a hot afternoon. Statistically, about 65 percent of our total energy use in the summer can be attributed to air conditioning. This means, of course, it is a big part of what we pay for in terms of electricity. To save money and reduce energy costs, many people choose to keep their thermostat a little higher than the recommended 78 degrees. In truth, every degree lower will increase your average energy bill by about 2.5 percent, so if you raise your thermostat by two degrees, you could potentially save 5 percent overall. Ceiling fans don’t add any efficiency to your AC, but they do help keep you cooler, which means you may refrain from lowering the thermostat. Major appliances, such as washers and dryers, give off a great deal of heat. This may contribute to the heat inside your home, so running your laundry at night may reduce the burden on your AC system. A smart thermostat is a great way to increase the efficiency of your AC system and save money at the same time. You will be able to access and adjust your thermostat via a smartphone app, meaning you can reduce your energy load when you are not at home. You can pre-program them to turn on just before you come home and shut off when you’re at work. Some may even be able to let you know when service is needed or filters need to be replaced. If possible, install your unit in a shady place. This can extend the life of your condensing fan motor by about double. In Las Vegas, this part needs to be replaced every 5 to 10 years, on average. Get your unit inspected every year to ensure it is in good working order. Change air filters regularly, every 30 or 90 days. Hose down your outdoor condensing units on a yearly basis to clear it of dirt and dust. Remove bushes and weeds in a two-foot diameter around your condenser to promote unobstructed airflow. Unless you have severe allergies or respiratory issues, don’t use the pleated filters as they will make your unit work harder. AC Plus has been providing quality air conditioning service in Las Vegas for more than two decades. For any type of AC installation, sales, service or maintenance, call us first. You’ll be glad you did. Is your air conditioning system ready for the coming Las Vegas summer? Summertime in Las Vegas is famously hot. You depend on your cooling systems to keep you and your family comfortable, but those high energy bills are not pretty. Fortunately, there are ways to reduce the amount of energy you use and keep your ac systems running more efficiently, even on the hottest days of summer. If you have an outdoor unit and if this is the first time you will be starting your system for the season, check your panels before you switch on. If any part of the panel is missing or if it is not aligned, call AC Plus right away for an inspection before you put yourself at risk of an electrical shock. If any plants have grown over your unit or if any loose debris is blocking it, clear it all away before you start it up. Anything that obstructs the airflow can potentially put more strain on your system and increase your energy spend. Making sure your condenser coils and the evaporator clean and dust-free is the single most important thing you can do to extend the life of your AC unit. For larger units, it is always best to call a qualified technician as we have solutions designed especially for this purpose. The air quality inside your home is important to your wellbeing and that of your family. During the winter, your air filter will have gathered more dust and debris than usual. Starting in the springtime, check your filters monthly and change them if they appear dirty. This will promote even, unobstructed airflow, and your unit won’t have to work so hard to deliver cool comfort. On first startup, turn your thermostat down to a few degrees below room temperature. This should trigger the system to turn on and you should feel cold air coming from your vents. If you don’t, call the HVAC specialists at AC Plus right away. Keep in mind that as the mercury goes up, so do our service calls, so it’s always best to be proactive. Giving your AC system a tune up is always a good idea in the spring and fall. 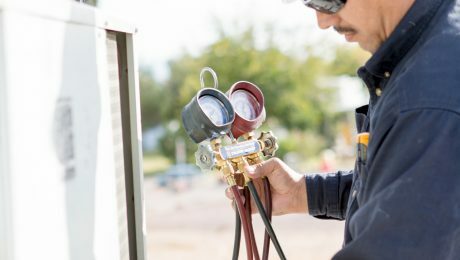 Keeping your system properly maintained will help you avoid emergency calls in the middle of the summer, ensure your home stays cool and comfortable, and may even lower your energy bills by as much as 30 percent. Need HVAC service in Las Vegas? Call AC Plus today. We are always ready to deliver on comfort, quality, and customer service excellence. Do I need to replace my entire AC unit? Or just the compressor? The scenario usually plays out something like this: the unit has stopped working, so a service call is put in. The contractor recommends compressor replacement, but the cost is in the range of $1500 – $2500, depending on the unit. The newer, upgraded model of a similar system would cost in the range of $4500 – $9K to replace brand-new. If you’re under a great deal of stress to get the AC running again, such as if it’s a commercial or residential building whose tenants are putting the pressure on, it might be difficult to make this decision on the fly. If you’re like most people, the immediate reaction would be to balk at the sticker shock of a new unit, so you’ll probably be tempted to take the quick-and-dirty solution and simply replace the compressor. However, there are a few points you should consider before pulling the trigger. A new air conditioning system will be approximately 33% more efficient than the one you are replacing. The money you save on your energy bills will pay for itself in approximately 15 years. The money you have allocated for a new compressor could be applied to the purchase of a new unit. This could cover as much as 1/3 of your down payment on the brand new unit. If you do opt for compressor replacement, it will still be housed inside an AC unit that will need ever more costly repairs as time goes by. Don’t forget, your old unit will be far less efficient than a new one, even with a new compressor. Current HVAC technology is cleaner, greener, and will save you a lot of money. The longer you keep your old system running, the more expensive repairs are going to become. Typically, maintenance, repairs and replacement parts for a commercial unit will require a budget of about $5K over its 15-20 year life cycle, but the longer you hold on to your unit, the higher that number is going to climb. This information is not meant to push you in one direction or another, but it’s always good to know where you stand in the bigger scheme of things so you can make an informed decision. Being proactive when it comes to AC maintenance will extend the life of your investment. You should budget a minimum of $650 every 5 years for part replacements like repair and maintenance contracts as well as replacement of fan motors, capacitors, and other small parts. Keeping your air filters clean and free of dust and debris will also extend the life of your compressor, and regular preventative inspections should be part of your maintenance protocols. A good rule of thumb is to change air filters every three months. The batteries in your thermostat should be changed every year to prevent breakdowns, and each spring and fall a seasonal maintenance check-up should be performed. By attending to these small but important details you can easily extend the life of your AC system, making that decision to repair or replace a matter for the distant future. If you have need of any AC repairs or maintenance, call ACPlus today. We serve Las Vegas and surrounding areas, and we always stay cool under pressure.